Ubud, a town in central Bali of around 30,000 people, is far removed from the nightlife bikini scene in Kuta, and is regarded as the cultural centre of Bali. It is famous as an arts and crafts hub, and much of the town and nearby villages seems to consist of artists' workshops and galleries. There are some remarkable architectural and other sights to be found, and a general feeling of well being to be enjoyed, all thanks to the spirit, surroundings, and climate of the place. Ubud has a known history back to the eighth century, when the Javanese Buddhist priest Rsi Marhandya came to Bali from Java, and meditated at the confluence of the two Wos rivers at Campuan, just west of the modern day town centre. A shrine was established and later expanded by Nirartha, the Javanese priest who is regarded as the founder of Bali's religious practices and rituals as we know them today. At this time the area was a centre of natural medicine and healing, and that is how the name Ubud originated: Ubad is ancient Balinese for medicine. Further temples and monasteries were established over the next 400 years or so. 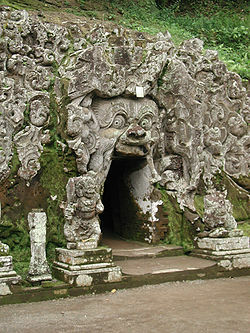 The temple complex at Gunung Kawi, and the cave temples at Goa Gajah (just east and northeast of Ubud), are architectural remains from this period. Many of the dances, drama and rituals still practised in Ubud today, originated at this time. King Airlangga ruled all of Java and Bali in this era, and his seat of government was located in what is now the village of Batuan, just southeast of Ubud. In 1900, Ubud became a Dutch protectorate at its own request, and the colonialists interfered little, allowing the traditional arts and culture of the area to remain relatively unchanged. The modern era of Ubud perhaps began in the 1930s, when foreign artists were encouraged by the royal family to take up presence in the town. From their Ubud base, the likes of Walter Spies and Rudolph Bonnet were instrumental in promoting an understanding of Balinese art and culture worldwide. From the 1960s onwards, travellers started to arrive in earnest, mostly intrepid types as the infrastructure was still very limited indeed. Since then, Ubud has developed rapidly into a high-profile, top-class international destination, whilst still maintaining its integrity as the centre of Balinese art and culture. Jl Monkey Forest, which runs south through town to the Monkey Forest, is a built-up area, and home to a wide array of accommodation, art galleries, and cafes, as well a number of local services such as schools, a sports field, pharmacies, and travel agents. Jl Hanoman, which runs parallel to Jl Monkey Forest just to the east, is a bit quieter and makes for more pleasant walking. Due to its elevation at 600 m above sea level, Ubud enjoys cooler temperatures than the coast, and it is sometimes necessary to bring a pullover for the evening. The midday sun can still be scorching though and the humidity often relentless; a murderous combination for an outing of 'temple tramping' which, in hilly Ubud, usually requires climbing up and down staircases. (Head out early to beat the heat and the crowds.) If there is a time to avoid, it would be the depths of the wet season in January and February — when it rains in Ubud, it really rains. Bina Wisata, Jl Raya Ubud (just west of Ubud Market), ☎ +62 361 973285. Not especially helpful, but they always have a few leaflets, and local businesses advertise current events there. There are regular public bemos from Denpasar's Batubulan terminal to Ubud which cost 8,000IDR (although foreigner rate is 50,000IDR in 2016 and hard to bargain) and take about an hour. Most bemos run in the early morning, and in the later of the day it is getting difficult to find a bemo leaving and drivers try to pursue tourist to hire entire vehicle for 200-300,000IDR, and you will not find any after 4PM. In the opposite direction, bemos depart every morning from the central market (northern entrance) in Ubud. If you want to take a taxi to Ubud from South Bali, it is best to charter the vehicle for a return trip, otherwise, you'll be hit with a 30% fee for going out-of-town. Metered fares, one-way and not including surcharge, are around Rp 150,000 from Denpasar and Rp 200,000 from Kuta. You can also rent a car in Kuta for a day in some local rental company around 15-25$, will be also useful to explore the extended vicinity. Perama offers daily direct transfers to Ubud from Sanur, Lovina, Kuta, Bedugul, Candidasa, and Padang Bai. When coming from Ngurah Rai International Airport you need to take a taxi to Perama's Kuta branch first, when going to the airport direct transfers exist. These are convenient and inexpensive; e.g. four times per day to the airport for Rp 50,000. Rather less conveniently, the Perama terminal is not located in the centre of Ubud, but about two km south in Padang Tegal, on Jl Hanoman just south of the intersection with Jl Monkey Forest. You can go to the "official Tourist Information" (just in the middle of town, on the big crossroad, opposite the market at Monkey Forest Road/Jalan Raya Road) and buy your ticket there (official outlet, same price) and Perama will pick you up there, to transfer to the Perama Bus Hub out of Town. Ubud is generally a little quieter, and the streets calmer than the more urbanised parts of Bali. So whilst traffic is slower than in downtown Kuta for example, the sidewalks are often blocked by motorbikes, or a collapsed section necessitates a step off the sidewalk potentially placing you in the path of traffic. That traffic could be a tricycle or a truck, so keep your wits about you. Blame Elizabeth Gilbert. Those of you who managed to make it through the turgid best-selling novel Eat, Pray, Love, might have an inkling of what is coming up. 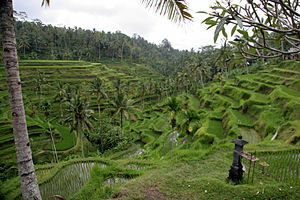 Ubud features quite heavily in our heroine's search for fulfilment, and the knock-on effect in the town has been huge. Acolytes have swarmed to Ubud looking for (and sometimes finding) places and people referenced in the book. The actual characters mentioned are surely sick and tired of rather desperate looking thirty-something single women turning up on their doorsteps. The economic benefits of the novel to the area ratcheted up a whole other notch in mid-2009, when the eponymously named movie was shot in and around Ubud, Julia Roberts and all. Just be aware though that Ubud cannot necessarily guarantee a remedy for every mid-life crisis. No metered taxis operate in Ubud, and any you see will be dropping off passengers from further afield. You may however encounter many locals offering a taxi, who sometimes are very persistent. These are not actual taxis, but "local cars" (see below). If you do not need a taxi, it's best to avoid eye contact with those offering a ride, as they may follow you with offers of tours of the area, etc. If you are continually being harassed, a polite "no thank you" (or "tidak terima kasih", the Indonesian equivalent) may work. Most local transport comes in the form of SUVs or minivans that can be hired with a driver for specific trips. Look for the circular yellow "E" logo on the windshield certifying them as Ubud Transport Association members. You can (and should) haggle a bit over the price, and pay less than for the equivalent journey in a metered taxi. A short trip should be less than Rp 20,000, and drivers will be glad to wait for you for a return fare. Ubud is so crammed with attractions it can almost seem like a visual assault at times. Try to make sure you allocate at least a week for your visit here, and take your time to explore properly. Visitors who jump up to Ubud for just two or three days of their Bali holiday, stand little chance of understanding much of what is going on around them. The key historical sites are located out of town, some as far as 20 km away, and you might find it worthwhile joining a tour to visit these. If you do visit attractions such as Goa Gajah, Gunung Kawi, Pura Kehen and Tirta Empul under your own steam, try to find a knowledgeable guide when you get there. Whilst you will certainly appreciate the beauty of these places, their cultural and spiritual significance may be lost without a guide. -8.523389115.2863331 Goa Gajah (Elephant Cave), Jalan Goa Gajah. 8AM-6PM daily. The centerpiece here is a cave dating back to the ninth century, the entrance to which is an ornately carved demon's mouth. Inside are some fragmentary lingam and yoni statues, as well as a statue of Ganesha. Large, carved guards stand around pools near the entrance, and a little path leads to a waterfall, rice fields, and some Buddhist stupa fragments. Some parts of the Goa Gajah complex were not excavated until the 1950s. Nominated as a UNESCO World Heritage Site. Rp 15,000, including sarong rental. -8.423361115.3123332 Gunung Kawi (Poet Mountain), Tampaksiring (18 km northeast from Ubud). 7AM-5PM daily. Dating from the eleventh century, this is presumed to be the burial complex of King Anak Wungsu and his many wives. Reached by climbing down 371 steps, the location at the bottom of a steep valley lined with paddy fields, is quite stunning. The smaller complex on the south side of the river is presumed to have been built for the King's wives, while the larger complex is thought to have been the residence of the King himself, and perhaps his concubines. The structures are carved into the sides of a steep river valley, and the river crossed by twisting trees and vines. You must take off your shoes before entering into the central pura complex. About 1 km downstream there are further tomb cloisters. On the way back up, take a break at Cafe Kawi which has cold drinks for Rp 10,000 and up. If you haggle for a taxi from Ubud, it should cost no more than Rp 150,000 to get there and back, with the driver waiting for you while you make the visit. Rp 15,000 including sarong and sash rental. -8.441757115.359863 Pura Kehen (Kehen Temple), Jl Sriwijaya, Bangli (just north of Bangli town centre, which itself is about 30 minutes north east from Ubud). 8AM-5PM daily. One of the most attractive temples in the whole of Bali, and as it is slightly off the beaten path, one which receives relatively few visitors. The temple was founded in 1206, and has an especially impressive 11-tiered meru in the inner courtyard. When you visit here take a little extra time to look around Bangli. It is a quiet and attractive market town. Rp 20,000. -8.50673115.2626224 Puri Saren Agung (Royal Palace, Water Palace) (across Jl Raya Ubud from Ubud Market). 9AM-5PM daily. This was the palace of the kings of Ubud until the 1940s, and some royal descendants live there to this day. Parts of the complex are off limits to the public, but entry to the rest is free, and this is Ubud's best setting for dance performances (see Do). -8.41639115.3155 Tirta Empul, Tampaksiring (Follow Jl Raya Tegallalang north for 8 km then slight right through the countryside for 7 km). 8AM-6PM daily. One of the holiest temples in Bali built around hot springs that still bubble in the central courtyard. The Balinese come here to bathe and purify themselves physically and spiritually, and during Galungan, the sacred barong masks are bathed here. The complex dates to 960, but the present buildings are largely modern reconstructions. Rp 15,000, including sarong and sash rental. -8.530064115.2931286 Yeh Pulu, Banjar Batulumbang, Bedulu nr Gianyar (turn off the Ubud to Gianyar main road about 400 metres east of the entrance to the Goa Gajah complex. Drive through Banjar Batulumbang until the road comes to an end. From here walk down the track). 7AM-6PM daily. 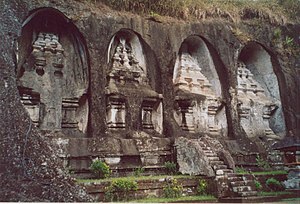 This complex of rock carvings is close to Goa Gajah but far less well known. The carvings date from the fourteenth or fifteenth century, and are set in a very attractive rice field. You can reach Yeh Pulu on foot through the rice fields from Goa Gajah, but you will definitely need a guide for the 45 minute walk as there is no path to speak of. In addition to the carvings, there is a holy well here, and the attendant priest will be happy to bless you with the well water. Temple dress code applies. This is a much underrated and under-visited site, and is highly recommended. Rp 15,000. -8.482108115.267777 Chapel of Mother Goddess, Rajarajeshwari Tripurasundari, Jl. Sri Wedari Km 3 (3 km north from the main Ubud street), ☎ +62 818 701658, e-mail: ubud@anandashram.asia. A modern chapel dedicated to the feminine aspect of the divine, such as Kuan Shih Yin, Mary Magdalene, Mother Mary, Lakshmi, Durga, Kali, Saraswati, Gayatri and others. Free, but donations are accepted. -8.518353115.2620838 Agung Rai Museum of Art (ARMA), Jl Pengosekan, ☎ +62 361 975742, e-mail: info@armamuseum.com. 9AM-5PM. Showcases works by well known Balinese artists, as well as international artists who made Bali their home such as Walter Spies, Adrian Jean Le Mayeur, Rudolph Bonnet and Arie Smit. The only painting in Bali by renowned Javanese artist Radan Saleh is exhibited here. They also run workshops for thirteen different aspects of Balinese art and culture. Cafe with tea and coffee. Price includes tea or coffee (hot or cold). Rp 80,000 (as of April '16). -8.5058115.25439 Blanco Renaissance Museum, Jl Raya Campuhan, ☎ +62 361 975502. 9AM-6PM daily. Before he passed away in 1999, Spanish artist Antonio Blanco was an absolute fixture on the Ubud art scene. His former home is now a museum showcasing his sometimes bizarre but always interesting work. Think Salvador Dali transplanted to Asia. In the garden you can take pictures of the exotic birds flying around. Rp 80,000. -8.505231115.26023910 Museum Puri Lukisan (Museum of Fine Arts), Jl Raya Ubud (on the main road just west of the market), e-mail: info@mpl-ubud.com. 8AM-4PM daily. When it opened in 1954, this was the first private museum in Bali. Three buildings showcase traditional and modern Balinese art. The displays are a little musty and English labeling is spotty, but some of the works, particularly the carvings, are quite amazing. Exhibits by noted artists I Gusti Nyoman Lempad and Rudolph Bonnet, among others. Rp 40,000. -8.497427115.26582111 Museum Rudana, Jl Cok Rai Pudak 44 (on the road to Mas, about a 10 min drive south of Ubud town centre), ☎ +62 361 975779, e-mail: rudana@senatorrudana.com. M-Sa 9AM-5PM, Su noon-5PM. A wide range of Balinese paintings is exhibited here, both traditional and modern. Run by its owner, artist Nyoman Rudana, who is often present. Rp 20,000, under 12yo is free. -8.492112115.2538112 Neka Art Museum, Jl Raya Sanggingan, Kedewatan, ☎ +62 361 975074, e-mail: info@museumneka.com. M-Sa 9AM-5PM, Su noon-5PM. This museum houses perhaps the most important art collection in the whole of Bali. Six pavilions house the various collections which include dedicated rooms for artists Arie Smit and I Gusti Nyoman Lempad. Rp 40,000. -8.503609115.26587513 Seniwati Gallery of Art by Women, Jl Sriwedari 2B, ☎ +62 361 975485. Tu-Su 9AM-5PM. This gallery features art only by women; "Seni" is Indonesian for art and "Wati" means women. -8.447663115.2772114 Tegallagang. Northeast of Ubud, the land starts to become more undulating, and this is a good place to view Bali's classic rice terraces. This village is somewhat a tourist trap, but it is worth braving the hordes of trinket peddlers to view the stunning terraces. From the town center, take Jl Raya as far east as you can go, and then turn north and continue about nine km until you reach Tegallalang. Look for the picture postcard rice terraces on you right-hand side. For those moving on north to the Kintamani area, this is on route and makes for an easy stop. -8.599985115.25186115 Bali Bird Park, Jl Serma Cok Ngurah Gambir, Singapadu, ☎ +62 361 299352, e-mail: sales@bali-bird-park.com. 9:30AM-5:30PM daily. A splendid 2-hectare aviary park with more than 250 species of birds in well thought out, attractive enclosures. The park has an enlightened, modern attitude to exhibiting animals, and this is obvious from the very open, walk-in aviaries, and the number of free range birds throughout the park. Also has a notably good cafe. One of Bali's best formal attractions. Adults US$26, children US$13. -8.497753115.26302516 Botanic Garden, Kutuh Kaja (on the road to Kutuh Kaja village which runs north from Jl Raya Ubud close to BCA Bank). 8AM-6PM daily. The recently opened Botanic Garden is a wonderful way to spend a few hours walking around and exploring the valley that it fills. It is best to go in the morning and avoid the afternoon heat. Rp 50,000. -8.518735115.25858617 Monkey Forest, Jl Monkey Forest, ☎ +62 361 971304, e-mail: info@monkeyforestubud.com. A sacred forest full of ravenous monkeys, so don't bring any food or you will risk bites and a need for rabies injections. If you are bitten, visit the first aid clinic near the entrance at the bottom of Jalan Monkey Forest. If you want to feed the monkeys despite the risk of getting bitten, there are bananas for sale. 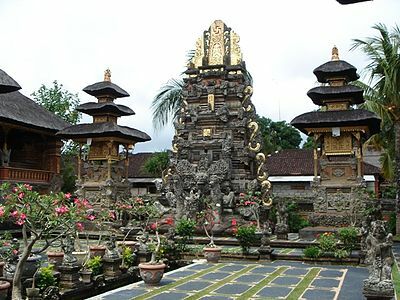 Stroll through to find Pura Dalem Agung Padangtegal, a temple of the dead. A visit to the very informative website beforehand is highly recommended. Entrance 50,000 Rp for adults, 40,000 Rp for children (12 and under). -8.491582115.27459418 The White Herons of Petulu, Petulu. Every evening between 15,000 and 20,000 cattle egrets, known colloquially as white herons and in Balinese, kokokan, roost in the village of Petulu just ten minutes north of Ubud. It is quite a spectacle as these large, elegant white and rusty orange birds arrive in countless groups and tussle for the prime roosting spots. Each morning at dawn they leave en-masse to find feeding spots around the island. Some also breed in the area and nests can be seen in the roadside trees. The cattle egrets are joined by smaller numbers of little egrets and Javan pond herons. According to local legend, the egrets first appeared here in such large numbers after one of the worst massacres of suspected communists during the troubles of 1965. This led local villagers to believe that these birds are the souls of the slaughtered, and ceremonies to that effect are still held today. The village of Petulu is reached by heading east from Ubud town centre on Jl Raya Ubud until you meet the obvious junction with Jl Raya Andong. Turn left, and go up the hill for about 2 km until you see the sign posted left turning on Jalan Kintamani to Petulu village. Go into the village and you will see signs and warungs set up in the best places to view the spectacle. Get there by 5:30PM. 15,000 per adult. As a centre of the arts, Ubud has dance and shadow puppet performances every night. There are also plenty of spas for resynchronising your chakras, and all manner of spiritual classes and treatments, some distinctly less genuine than others. -8.500163115.2725881 Bali Center for Artistic Creativity (BCAC) (Nyoman Art Gallery), Jl Raya Petulu, ☎ +62 361 970034, e-mail: brcerobert@yahoo.com. Art studio nestled in beautiful grounds and galleries offering art classes from beginners to teachers, and internationally accredited courses run by Bruce Sherratt. -8.50357115.2775672 Payuk Bali Home Cooking Class, Banjar Laplapan Ubud Bali, ☎ +62 361 8987854, e-mail: info@payukbali.com. Traditional Balinese cooking such as sate lilit, Balinese salad, and nasi kuning. -8.504016115.2786423 Paon Bali Cooking Class, Laplapan Village, ☎ +62 813 37939095. Traditional Balinese cooking class in the home of a very hospitable family. They offer a pick-up in Ubud. -8.528389115.2856945 Ubad Ubud Bali Cooking Class, Jln. Ki Pasung Grigis, Banjar Tengkulak Kaja, Desa Kemenuh, ☎ +62 82236177779, e-mail: info@ubadubudbali.com. 7AM-18AM. Introduction to the exotic ingredients and unique culinary heritage of Bali, set in Balinese compound. IDR 375000. Barong Dance, Batubulan (about fifteen minutes south of Ubud on the main road to Sanur). A Barong dance performance takes place here every day at 9:30AM, lasting about an hour. It is very much a performance for tourists, and the story is of the never ending battle between good and evil. There is actually not much dancing and a lot of talking in this performance. While buying a ticket, you will get a description of the forthcoming performance. Rp 80,000. -8.504442115.258146 Pura Dalem, Jl Raya Ubud (inside the Pura Desa Ubud). 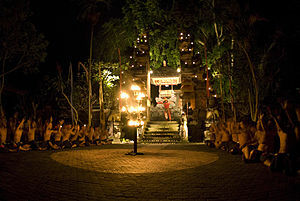 One of the best kecak performances in Ubud, every Friday and Monday evening. Staged in beautiful surroundings outside under the banyan trees, and followed by a fire dance. Excellent ambiance and the fire dance at the end is impressive. A leaflet in several languages is at disposal to understand the illustrated Ramayana story. However, parts of the performance can get repetitive. Rp 80,000. Puri Saren & Puri Saraswati (just east of Jl Monkey Forest), Jl Raya Ubud. Smack dab in the centre of town, dance performances are staged here almost nightly. Rp 75,000+. Sang Spa, Jl Jembawan 13 (at the bend in the southern part of Jl Jembawan, walk down a small side street), ☎ +62 361 8631816. 9AM-9PM. Small full-service day spa, owned and run by a young couple named Ngurah and Asti. Simple, secluded, clean and nicely decorated. Very professional staff. From Rp 90,000. Spa Hati, Jl Raya Andong 14, Peliatan, ☎ +62 361 974 672, e-mail: spahati@balihati.org. Prices start at Rp 110,000. The grounds are lovely and there is a pool and jacuzzi. This spa is a non-profit organisation which uses its income for charity programs. They offer pick up from your hotel. Ubud Sari Health Resort, Jl Kajeng 35 (a 10 minute walk northwards up Jl Kajeng from the centre of Ubud), ☎ +62 361 974393. 10AM-9PM. Emphasis on Balinese-style healing therapy. Offers alternative health care, a day spa, beauty salon, health massage, vegetarian restaurant and yoga. From US$15. -8.51382115.2615410 Verona Spa, Jl Monkey Forest (at the end of the alley by Yulia Hotel), ☎ +62 361 970975, e-mail: budiart2015@gmail.com. 9AM-9PM. Private individual or coupled rooms that open onto a rice terrace. 4 hour package called the Verona Spa Experience has a massage, body scrub, flower bath, facial, manicure, pedicure, and hair creme bath (not to be missed if you like having your head massaged). From Rp 150,000. Tamarind Spa, Jalan Raya, Ubud (5 minutes walk from the town center), ☎ +62 361 970923, e-mail: murni@murnis.com. 10 am - 9 pm. Excellent spa with professional and well qualified therapists. which attracts rave reviews. Full spa menu and spa packages menu. They are also able to give massage training lessons. www.murnis.com. Pertenin Body Care, Jl Jatayu, ☎ +62 361 972834. 10AM-9PM. Facial treatments and massage in a relaxing, modern environment. Customer may select the oils and herbs for any treatment. From Rp 85,000, free pick-up. Adventure & Spirit, Jl Raya Mas - Ubud, ☎ +62 85 333 88 55 98, e-mail: canyon@adventureandspirit.com. 9AM-9PM. Canyoning is an ultimate outdoor adventure and sport using a variety of techniques that may include walking, abseiling, jumping, sliding down natural slopes and swimming in white water for aquatic canyons. And of course discover beautiful and hidden places at the heart of Balinese nature. White Water Rafting become the most popular attraction. Ayung River Rafting, Jl Raya Ir. Soekarno, ☎ +6281 558 418 737, e-mail: reservation@balitraveldeal.com. Free hotel transfer, 2.5 hours rafting experience. Guide, all boats in good condition, waterproof bag, helmets, lunch and insurance also included. They also do volcano climbs, countryside cycle tour, etc. USD 35.00/person all inclusive. Bali Countryside Cycling, Jl Raya Ir. Soekarno, ☎ +62 81 558 418 737, e-mail: reservation@balitraveldeal.com. A/C hotel return, 3.5 hours downhill biking, Light Breakfast, Bike and Safety equipment, Guide, Mineral water en route, Lunch and Insurance covered. USD 40.00/person all inclusive. Bali Bintang Tour, Jl Raya Pejeng - Tampaksiring, ☎ +62 361 981699, e-mail: balibintangtour@gmail.com. Hotel transfer, light breakfast overlooking Mt. Batur, well maintained bikes, water en route, lunch, insurance covered. Rp 500,000/person all inclusive. Bali Bagus Cycling Tours, Jl Raya Pengosekan, ☎ +62 85253 000099, e-mail: balibaguscycling@gmail.com. Offers many opportunities to discover the countryside. Rp 400,000/person all inclusive. Bali Budaya Eco Tours, Jl Raya Pengosekan, ☎ +62 361 975557, e-mail: baliecocycling@gmail.com. Free pickup from hotel, breakfast with a view of Mount Batur, visit to coffee plantation, downhill cycling through rice paddies and villages, visit to a Balinese family compound, optional flat/uphill cycling and a generous buffet lunch. Two guides per group, bikes in good condition, helmets, water also included. Also do volcano climbs, jungle treks, etc. 40$/person all inclusive. Bali Bike Adventures, Laplapan Village, ☎ +62 361 9234 627, fax: +62 361 898 7934, e-mail: info@balibikeadventures.com. Includes return hotel transfer, mountain bike with safety helmet, breakfast, towel and mineral water, all entrance fees, professional guide, buffet lunch, insurance covered for each participant. Rp 350,000/person all inclusive. Bali Hai Adventures Specialist, Jl Raya Astina Timur, Gianyar, ☎ +62 878 62331333, e-mail: balihaitour@gmail.com. See the Bali countryside at a leisurely pace on a bicycle. Includes private A/C van (min 2 pax booking), mountain bike and safety helmet, breakfast and lunch, fruit and mineral water on tour, entrance fees and personal insurance coverage. Rp 370,000/person. Bali Adventure Tours, ☎ +62 361 721480, e-mail: info@baliadventuretours.com. Established in 1989, one of the first whitewater rafting adventures in Bali. They offer packages that include their elephant safari park & lodge, cycling, rafting and an elephant safari. Free pickup from hotel. US$100,000 insurance is provided. About US$60. Sobek Bali Utama, ☎ +62 361 287059, e-mail: sales@balisobek.com. Specialise in white-water rafting and cycling tours. Established in 1989, this was the first company of its type in Bali, and they are distinctly less package-oriented than their main competitor. About US$60. Taman Hati Yoga and Meditation Center, Banjar Nyuh Kuning, ☎ +62 361 974739, e-mail: tamanhati2000@yahoo.com. This centre was founded in 2000 by two local men, both from families containing many generations of Hindu priests. Set up for both complete beginners, and those already experienced but wishing to broaden their horizons. Every Wednesday at 7:30PM, there is a free class entitled "World Peace Meditation". From about Rp 90,000. Ubud Yoga Centre, Jl Raya Sanggingan (almost opposite Neka Museum), ☎ +62 361 970460, e-mail: julie@baliyogahealing.com. Expat-run centre offers everything from single attendance classes up to residential yoga instructor training courses. From Rp 90,000 per session. Good value ten class pass for Rp 550,000.. The Yoga Barn, Jl Hanoman, Pengosekan, ☎ +62 361 970992, e-mail: info@theyogabarn.com. Range of classes and an excellent set of teachers mostly in the Ashtanga/Vinnyasa school. Upper studio has great views of the surrounding rice terraces. Residential packages, multiple day classes and simple single entry classes. If you are a teacher, they offer the possibility of renting the centre to host your classes. From about Rp 100,000. Anand Ashram@Ubud, Jl. Sriwedari Km 3, ☎ +62 818 701658, e-mail: ubud@anandashram.asia. Non-profit institution offering yoga, meditation, satsang, kirtan, bed and breakfast. Visiting teachers and students are welcome to use the space for their programs and stay on donation basis. -8.507755115.2630071 Ubud Market (at the corner of Jl Monkey Forest and Jl Raya Ubud). This is a double storey warren of stalls bursting at the seams with wood carvings, batik shirts, sarongs, and all manner of other souvenirs aimed specifically at tourists. The merchants here haggle with tourists for a living, and think nothing of asking for ten times the going price, so try to establish a baseline before you go in to buy. Most of the merchants downstairs will lose interest if you try to get a reasonable price. It is better to try the shops upstairs where you will find the same products often for sale at lower prices. You will still need to use your best bargaining skills of course. Try to avoid the period from 11AM-2PM when tour buses from further afield tend to arrive en-masse. :If hiring a car for a day, it might be worth it to make a stop in Tegallalang, where they are geared more towards wholesale buyers. The Sukawati Market is crowded and sells trinkets in bulk as well, but quality is dubious. The 25 km road to Ubud from Sanur in the south passes through a series of small towns and villages which specialize in the production of particular arts and crafts. The towns are Batubulan/Singakerta for stone carvings, Celuk for silver jewellery, Batuan for paintings, and Mas for wood carvings. The whole area is sometimes referred to as the "craft villages" of Bali, although it is all a bit more built-up and congested than one might infer from the term "village." This is the best area to see and buy a wide variety of Balinese craftwork in a short period of time. There are many large showrooms where arts and crafts in the Balinese style are offered for sale. Nearly all organised day-tours of central Bali stop at one or more of these showrooms (and the tour operators usually have a financial tie-up with the places where they stop, collecting a commission on purchases.) Be careful, many of these shops specialise in pricing based on huge commissions to the drivers and tour busses. -8.509383115.266812 Ganesha Bookstore, Jl Raya, e-mail: info@ganeshabooksbali.com. 9AM-6PM daily. Second hand bookstore. Also has great range of new books about Bali and Indonesia. Been around since 1986 and now has a second branch in Seminyak. Pondok Pecak Library, Jl Monkey Forest (on the opposite side of the football pitch from Jl Monkey Forest), ☎ +62 361 976194. 9AM-5PM daily. This privately run community library often has decent fiction and other books for sale. By buying here you are supporting their mission to make free books available to Balinese schoolkids. When you visit, check to see if they have any cultural performances coming up. Also has a small cafe serving home-made snacks. Sukawati Art Market, Sukawati (about twenty minutes south of Ubud on the main road to Sanur). This huge market is like a one-stop centre for all the craft villages between Sanur and Ubud. Many souvenir shop owners from around Bali wholesale purchase their items here, and prices are considerably lower than in the tourist centers like Kuta, Sanur, and Ubud town centre. For a taste of everyday, go to the food and produce market opposite the art market. Threads of Life, Jl Kajeng 24, ☎ +62 361 972187, e-mail: tac@threadsoflife.com. 10AM-7PM daily. A fair trade store that stocks commercially made, traditional hand-woven textiles from Bali and all points east in Indonesia. Or better yet, go to the shops that are actually from the villages and outer islands like Timor and Flores, and specialize in traditional weavings. -8.505889115.250231 Bubu Warung, Jl Penestanan Kelod, e-mail: bubus_annasari@yahoo.co.id. 8AM-10PM daily. Healthy and delicious Balinese cuisine with plenty of choices on the menu. If you have any special requests, Ibu Made will be happy to cater for you. Dewa Warung, Jl Goutama. 10AM-9PM daily. Dewa's is one of the better cheap places to eat in town. Serves all the usual Balinese and Indonesian dishes. The most expensive item on the menu is Rp 20,000. -8.505953115.264342 Ibu Oka Warung Babi Guling, Jl Suweta (around 200 m north of the Jl Raya Ubud-Jl Suweta-Monkey Forest Rd crossroads turn right into a side street and follow a small gang about 100 m ahead. There are lots of signs). 11AM-3PM daily. A Bali culinary experience. The babi guling (spit-roasted pig) here is world-famous, and this humble eating place is virtually a place of pilgrimage. The roast pork is served with rice and spiced veggies, order the special (Rp 55,000) to get a bit of everything — including offal and blood sausage. There are normal tables and chairs but you can also sit on the floor at low tables inside the bale (pavilion). From Rp 25,000. Oka, branch in Mas (on the main Teges-Sukawati road on the route between Ubud and the airport), ☎ +62 361 976345. Unlike the original, where comfort and appearance are not strong points, this outlet is a two-storey restaurant which is spotless, airy and comfortable. -8.522234115.26293 Pizza Bagus, Jl. Raya Pengosekan (500 m south of the Monkey Forest Rd. ), ☎ +62 361 978520. 9AM-10:30PM. Provides fresh made to order pizzas, pasta and other Italian style meals. Italian gelato and a full deli are also available. Eat-in, take-out or delivery. Organic market held every Saturday morning. Games and TV are provided to entertain children. Free wifi. Main course from Rp 22,000-50,000. Sawah Indah Warung Ikan Bakar, Jl. Raya Goa Gajah (Peliatan), ☎ +62 361 785 8080. 9AM-10PM. Lunch or dinner with a rice field view. Fish pond. Relaxing and good for a family or group. Rp 50,000. Sari Bamboo, Penestanan. 8AM-9PM daily. A tourist class warung, with food freshly cooked to order, set amid tropical gardens on the main road to Penestanan village. 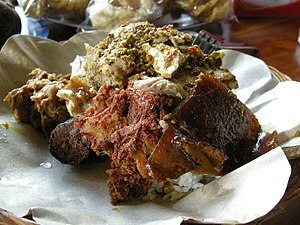 Mainly Indonesian food flavoured to suit the taste of western visitors. The warung and bungalows are easily distinguishable by the display of modern art works by the resident artist. No hard sell though, just good food in beautiful surroundings at good prices. Serves breakfast, lunch and dinner. Rp 15,000-25,000. Warung Aja, Jl Monkey Forest (about halfway down Jl Monkey Forest, the warung is set back away from the road, on the right side if heading south towards the Monkey Forest), ☎ +62 361 973398. 9AM-10PM daily. Cosy and friendly, Warung Aja is run by a couple from Java and is a good place to sample Indonesian food from Java, such as nasi rawon, nasi kuning, and pecel. There are also the usual Balinese food items on the menu like sate lilit. Mains from Rp 20,000. Warung Igelanca (Iggy's), Jl Raya Ubud, ☎ +62 815 8943251. 11AM-10PM daily. Cheap and cheerful Indonesian favorites like nasi campur, fried rice and noodles, plus (this being Ubud) a range of herbal drinks, such as Ginger Jive. -8.50746115.265154 Dapur Bunda, Jalan Sriwedari (off Jalan Raya Ubud). Indonesian and western "buffet" style eaterie with the style and quality of a mid-range restaurant. Offers tapas-sized portions from Rp 4,000 to Rp 14,000 on saffron, brown or plain rice. Warung Lada, Jl Hanoman. 10AM-9PM daily. Choose from the various Indonesian side dishes (nasi campur-style) that are displayed behind the counter. You can pick as many dishes as you like as you pay for each serving. A full plate is around Rp 30,000 including a fresh fruit juice. Be on time for lunch because it is usually packed. Alchemy, Jl Penestanan Klod, ☎ +62 361 971981, e-mail: hello@alchemybali.com. 7AM-9PM. A 100% raw vegan organic cafe & juice bar, organic health food store, and holistic clinic. Yummy breakfast bar with fruits, nuts, seeds, and raw vegan organic nutmilks and yoghurts from 07-11AM, delicious salad bar with amazing superfoods and toppings from 11AM-9PM. Alchemy´s has an Instagram account at @alchemybali. 39.000 RP - 60.000 RP. Batan Waru, Jl Dewi Sita, ☎ +62 361 977528, e-mail: info@baligoodfood.com. 8AM-midnight daily. Long established Ubud institution. Excellent Balinese and other Indonesian food as well as western options, in a well designed space. Also serves top quality coffee, and has a dessert menu which includes an especially notable version of Balinese black rice pudding (bubur injin). Indoor and outdoor seating. Most mains Rp 40,000-60,000. -8.490608115.2534515 Bakmie MG Ubud, Jl Raya Sanggingan (5 mins walk from Museum Neka, 8 mins walk from Naughty Nuri's Warung Ubud), ☎ +62 361 971949, fax: +62 361 971879, e-mail: info@munaribali.com. 08.00 AM - 10.00 PM daily. Comfortable Balinese modern design for breakfast, lunch and dining at Ubud area, free wifi. Specialty in noodles and Asian food, you may taste the various food menu offered, such as Bakmie Special, Bakmie Hot Plate, Bebek (Duck), and Ayam (Chicken) Cha Siew in affordable price. from IDR 20.000 to 200.000. Clear Cafe, 8 Jalan Hanoman, ☎ +62 361 8894437. An organic cafe with a variety of vegetarian, vegan, and raw food-friendly selections. Free Wi-Fi. Try free samples from their bakery at the front of the restaurant! Mains about Rp 25,000-70,000. Cafe des Artistes (Jl Bisma), ☎ +62 361 972706. 11AM-midnight daily. This Belgian-owned eatery serves Indonesian dishes as well as a vast array of international classics. Famous for their grilled tenderloin steaks. Extensive winelist, cocktails, Belgian beers and homemade desserts. Free wifi from 11AM-6PM. To make sure you get a table for dinner, call ahead. About Rp 50,000 per head. Casa Luna, Jl Raya Ubud, ☎ +62 361 973282. 8AM-10PM daily. Large, long-established restaurant serving western and local dishes, and plenty that fall somewhere in between. Mains about Rp 30,000-50,000. -8.51801115.263226 China Moon, 8 Jl Monkey Forest (at the corner of Jl Hanoman and Jl Monkey Forest), ☎ +62 361 981492. 7AM-2PM daily. While China Moon is not packed during lunch and dinner time, it does have some of the better Chinese cuisine available in Ubud. The owner of the restaurant comes from Taiwan and is really passionate about cooking and helping customers. Unsurprisingly, Taiwanese food is the big thing here, so you might want to try the mushroom pork soup or any other stews and soups Taiwanese cuisine has to offer. Food from other regions of China is also served, as well as typical Balinese dishes (or a fusion of both). De Ubud Villas & Spa is from the same owner at the backside. Mains Rp 30,000-50,000. Havana, Jl Dewi Sita (right next to Tutmak after you cross the football field.). Very tasty Cuban food. Excellent paella and chorizo meatballs. There is also a good Latino band which plays there most evenings accompanied by local salsa dancers. Overall good fun. Mains about Rp 25,000-50,000. Murni's Warung, Jl Raya Campuan-Ubud (at the Campuan Bridge), ☎ +62 361 975233, fax: +62 361 972146, e-mail: murni@murnis.com. 9AM-11PM daily. Excellent western and Balinese food in a stunning, gorge setting. Elegant lounge bar. Historic, being the 1st real restaurant in Ubud founded by Murni herself in 1974. Also a shop with interesting collectibles and the odd real antique. Mains Rp 20,000-70,000. Naughty Nuri's Warung and Grill, Jl Raya Sangiggan (opposite the Neka Art Museum half way up the hill heading north out of Ubud), ☎ +62 361 977547. 10AM-11PM daily. Crowded roadside watering hole. Microbrews, great martinis and slabs of BBQ ribs. This is very much a standard stop for Korean or Japanese tour buses. Once a week they do amazing grilled tuna. Careful that the waitresses do not stick other peoples drinks on your bill. A few times a year they have parties where drinks are US$10 for as much beer as you can handle, for example during USA elections and the Superbowl. Mains Rp 20,000-70,000. Nomad, Jl Raya Ubud 35, ☎ +62 361 977169. 11AM-11PM daily. A long-standing institution that serves up a good selection of Balinese, Indonesian, and western dishes, but deservedly popular is their version of a tapas selection, consisting of bite-sized portions of local flavors. 12 pieces of tapas served with rice costs Rp 90,000 and feeds two. Also serves a wide range of cocktails and spirits. Taco Casa 'n Grill (Mexican Restaurant), Jl Raya Pengosekan (next to Alana's California Dreaming), ☎ +62 361 2123818, e-mail: info@tacocasabali.com. 11AM-10PM daily. Open kitchen, simple and fresh tacos (soft and crispy), nachos, 8-layer burrito, fajitas, cheesy enchiladas, quesadillas and taco salad bowl. Fresh blended tropical fruit juices or lassies, milkshakes, freshly prepared lemonade, pure juices, mineral water, hot drink, margarita, mojito, sangria and soft drinks. Mains Rp 22,000-45,000. Tutmak, Jl Dewi Sita (next to the football field), ☎ +62 361 975754. 8AM-11PM daily. A favorite with the expat crowd, Tutmak offers an international menu, but is especially famous for its superb coffee made from local arabica fresh roasted daily by the owners. Mains about Rp 25,000-50,000. -8.5178115.26378 Bebek Bengil (Dirty Duck Diner), Jl Hanoman, Padang Tegal, ☎ +62 361 975489, e-mail: ubud@bebekbengil.co.id. 11AM-10PM daily. An interesting restaurant with paddy field views and nice gardens. Famous for their crispy fried duck and some European-based menu items. They have a good selection of cakes as well. Free wifi in the area closest to the street. About Rp 100,000 per head. Cascades Restaurant, Jl Lanyahan, Br Nagi, ☎ +62 361 972111, fax: +62 361 970777, e-mail: resv@cascadesbali.com. A fine dining restaurant with French inspired menus mixed with Asian influences. Good views and hushed atmosphere. Has a large wine list. Mozaic, Jl Raya Sanggingan, ☎ +62 361 975768. 11AM-11PM daily. The brainchild of chef Chris Salans, this is one of the leading restaurants in the whole of Bali, and one which will please even the most jaded of foodies. Multi-award winning, including the coveted Les Grandes Tables du Monde award (the only restaurant in Bali ever to achieve that). Western prices, but worth it as a special treat. Try the degustation menu. Ubud is emphatically not party town: there are a few places for a quiet drink, but the strictly enforced local regulation that all live performances and loud music must end by 10:30PM puts a bit of a clamp on the local nightlife. More often than not, visitors have a quiet drink with their evening meal, and call it a night. Ary's Warung, Jl Raya Ubud 35 (opposite Puri Saraswati), ☎ +62 361 975959. 10:30AM-10PM daily. Don't be fooled by the name, this is a stylish watering hole with a large bar downstairs, complete with sofas and cow-leather bar stools, and a rather less busy restaurant upstairs. Drinks are expensive but generously sized. The Melting Pot Game Room and Pub, Jl. Pengosekan (across from The Pond restaurant and behind Delta Dewata), ☎ +62 815 7689113. 11AM till last man out. Pool hall and games room with full bar. Every nation is represented with a flag and customers are encouraged to sign their country’s flag. Food, music, table tennis, darts, foosball, video games, pool tables and general atmosphere make it a place where locals, expats and tourists often congregate. 8 Ball tournament every Tuesday night and 10 ball tournament on Fridays are open to all. Rendezvousdoux, Jl Raya Ubud 14, ☎ +62 361 7470163. 10AM-11PM daily. On Thursday evenings there is often a jam session with local expat musos trying their hand at various forms of ethnic music. Otherwise it is a generally quiet cafe. Ubud has a vast selection of lodging for all budgets. Many visitors prefer to stay out in nearby rural areas instead of in the town centre, ideally with views of the famous rice terraces, but this can make it a little difficult to get around. As in most of Bali, in all but the grandest of hotels, check-in and check-out times are a bit of a moveable feast. It is safe to assume about 2PM and 11AM. Ubud has many homestays which are the cheapest form of lodging, a good way to meet the locals, and the natural replacement for hostels on the backpacker circuit. If you want to stay in town, the area around Jl Monkey Forest is generally the most expensive little more expensive (from Rp 80,000-100,000 per night). If you want cheaper prices try the areas around Jl Hanoman, north of Jl Raya Ubud and further out in Peliatan. In the low season especially, bargains can be had by those willing to bargain. Jn Kajeng, close to the centre, is a peaceful, mostly pedestrianised street with many small budget to mid-range homestays - those on the west side have views at the rear towards the river, waterfall or nearby rice fields. -8.5147115.26471 Dewi Antara Homestay, Jl Sugriwa, Padang Tegal, ☎ +62 361 976072, e-mail: dewi.antara.ubud@gmail.com. A humble Balinese family homestay. Quiet and clean bungalows in a garden setting. The father participates in cultural activities (he's a dancer), so it's fun to watch him in traditional dress. Mum prepares the breakfast of toast, fruit salad and coffee. From Rp 250,000. -8.514115.26772 Family Guest House, Jl Sukma 39, Tebesaya, ☎ +62 361 974054, e-mail: familyhouse@hotmail.co.id. Friendly Hindu family makes you feel right at home. Rooms are placed in a lovely compound and includes a good breakfast. Rp 200,000-250,000. -8.5035115.26253 Gustis Garden Bungalows, Jl Kajeng No 27, ☎ +62 361 3610840. Balinese style with 25 m sq, private balcony, private bathroom. hot and cold water, king size bed, clothing cabinet, dressing table, ceiling fan, wash basin and standing shower. From about Rp 275,000. Jati Home Stay, Jl Hanoman, Padang Tegal, ☎ +62 361 977701. Rooms using natural, traditional materials of bamboo, marble and thatched roofs. An atmosphere of art and culture, all members of Jati's family are traditional Balinese artists. Learn Balinese painting and watch a group of children practice Balinese dancing. From about Rp 100,000. Ketut and Geks House, Jl Raya Bono, Bona Kelod, Blahbatuh, Gianyar (13 km southeast of Ubud), ☎ +62 361 945833, +62 85792529536, e-mail: ketutsura@yahoo.com. Rooms with private bathroom with cold and hot shower, overlooking rice fields. free WIFI From Rp 80,000 inc breakfast. Melati Cottages, Jl Penestanan, ☎ +62 361 974650, e-mail: melaticottages@hotmail.com. Traditional style rooms set around a cafe by a pool. You can walk in from north or south. From about Rp 220,000. Narasoma Homestay, Gang Beji off Jl Monkey Forest, ☎ +62 361 973404. Down a little lane off busy Jl Monkey Forest. Family home with accommodation. Balinese compound setting with traditional carved buildings, surrounded by coconut palms. Top floor has views of the central mountains and Mount Agung. Clean and airy, and breakfast is included. Rp 200,000-250,000. Nyoman Murjana Homestay, Jl Hanoman, Gang Anila No 7 (down the alley opposite Jl Jembawan), ☎ +6285 936116 712, e-mail: nyomanmurjana2005@yahoo.com. Check-out: 11AM. Clean, nicely furnished rooms in a traditional Balinese family compound. A breakfast is included with egg, toast, veggies, fresh fruit, coffee and tea, also has WiFi. The family can help with information, bicycle and motorbike rental. Double with hot shower from Rp 200,000. Rumah Roda Homestay and Restaurant (Jl Kajeng 24), ☎ +62 361 975487. Lovely family compound with rooms. The restaurant has a Sunday evening buffet. The book A Little Bit One O'Clock is about this place and family. About Rp 150,000. Shana Homestay, Jl Goutama No7, Padang Tegal (very close to the traditional & art market and Nomad restaurant), ☎ +62 361 97481. 3 bungalows in garden setting, each with 2 beds, breakfast included. Rp 100,000. -8.50924115.263174 Raka's House, Jl. Dewi Sita, Maruti Line. Quiet family homestay, bungalows with and without AC, free wifi, small pool. From 180,000 Rp. Anom Cottages, Jl Raya Sanggingan (about 25 min walk south of the Monkey Forest Road-Jl Raya Ubud crossroads), ☎ +62 361 8528521, e-mail: info@anomcottagesubud.com. Small bungalows with lovely views over the adjacent valley. 3 min from the town centre. Recently re-furbished. From Rp 450,000. -8.506103115.2518738 Dewa Bharata Bungalows, Jln Panestanan (Few metres from Blanco Museum), ☎ +62 361 977086, e-mail: sales@dewabharataubud.com. Balinese-style accommodation, double bed, twin bed, public pool, direct IDD phone, TV, free Wi-Fi, airport transport, motorbike rental, breakfast, restaurant. Rp 270,000-450,000. -8.506011115.2533599 De Munut Cottages (Munut Bungalows), Jln Panestanan (adjacent of famous Blanco Museum), ☎ +62 361 975039, e-mail: info@munutbungalows.com. Traditional Balinese architecture with spa, public swimming pool, internet services, free Wi-Fi, deluxe room, super deluxe room. Bali T House Village, Lodtunduh, ☎ +62 812 3932000. 1, 2 and 3 bedroom private villas in a traditional rice farming and carving village 5 min from central Ubud. Daily maid and breakfast service included. Shared pool with rice-field views. This is an environmentally friendly and ecologically sustainable compound and part of a Balinese village. Rp 500,000-600,000, including breakfast. Inata Monkey Forest, Jl. Monkey Forest (In the centre), ☎ +62 361 978267, e-mail: info@inatahotelubud.com. from USD 70. Jiwa Damai Bali Retreat, Jl Melati 3, Mambal (about 15 minutes with car from central Ubud), ☎ +62 361 8988384, e-mail: info@jiwadamai.net. Organic (permaculture) garden and retreat centre in small village close to Ubud. 6 modern minimalist styled rooms with king size, queen size or two twin bed and three garden lumbungs. Spacious open air lounge and dining area, fresh water pool, organic fruit and vegetables used to prepare meals. Yoga and meditation classes for guests. Facilities available for seminars and retreats. From US$60. -8.490608115.25345110 Munari Resort and Spa Ubud, Jalan Raya Sanggingan (5 mins walking distance from Museum Neka, 8 mins walk from Naughty Nuri's Warung Ubud), ☎ +62 361 971949, fax: +62 361 971879, e-mail: info@munaribali.com. Check-in: 14.00 PM, check-out: 12.00 AM (noon). 5-10 mins by car to Ubud center, Free Wifi in room, option of twin and double bed, room full AC, swimming pool, free bicycle to use based on request, Bakmie MG Restaurant specialty in noodles. All rooms with balcony overlooking nice garden, swimming pool. 2nd floor room can enjoy the beauty of ricefield next to Munari. Rp 550,000-1.200,000, including breakfast..
Oka Kartini, Jl Raya Ubud 35 (just across the bridge in Peliatan, east of Ubud town centre), ☎ +62 361 975759. Quirky old Balinese house complex on the edge of town. The rooms here are a bit long in the tooth, but decorated with more carvings and gold paint than the average temple. Friendly staff supervised by the owner Oka Kartini. Large art gallery, a small but pleasant garden pool. Shadow puppet shows 3 days a week (extra charge). Rp 340,000-511,000, including breakfast..
-8.5226115.256511 Puri Asri Villa & Spa, Jl Nyuh Bulan, Nyuh Kuning, ☎ +62 361 972550. In a very quiet spot south of town. 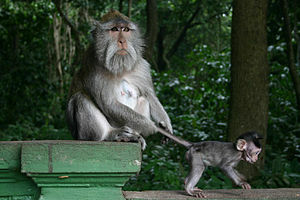 Offer a couple of scheduled shuttle rides to Jl Monkey Forest and back each day. Walking distance from town via the Monkey Forest. Villas have spacious rooms, A/C, bath and shower (including outdoor showers), patio. Breakfast delivered to room if you choose. Take cash as their credit card facilities don't always work. Rp 500,000 including breakfast. Puri Padi, Jl Hanoman, Padang Tegal (5 min walk southeast of the Monkey Forest), ☎ +62 361 8528521, e-mail: info@puripadiubud.com. A Balinese style hotel in green gardens surrounded by rice fields. From Rp 450,000. Puri Saraswati Bungalows, Main Rd. Puri Saraswati is located in the centre of Ubud Village. Rooms are set back from the road and quiet and there's a pool and WiFi. Airport transfers are available. US$70 including tax and breakfast. -8.5088115.262712 Sania's house, Jalan Karna No. 7 (At the Ubud Market walk South it's on your left), ☎ +62 361975535, e-mail: sania_house@yahoo.com. Beautiful place with clean rooms, swimming pool. Wi-Fi and breakfast included. From Rp 250,000. Sri Bungalows, Jl Monkey Forest, ☎ +62 361 8528521. Centrally located with 16 bungalow-style rooms in lush gardens. 50 m from the busy road, but very quiet except for the singing of birds. Simple but pleasant rooms with bamboo furniture, western toilets and hot water. Large pool with rice paddies beyond. Internet cafe on the premises. From US$57. Sri Ratih Cottages, Jl Penestanan, Campuhan, ☎ +62 361 8528521. 30 rooms, just west of the town centre. Large peaceful garden, good-sized pool, free wifi for guests, 24 hr room service. Long staying guests may find good value here. From US$30. -8.4988115.265113 Suastika Bed and Breakfast, Jl Suweta 52, ☎ +62 361 9080143. Suastika is a Hindu symbol of peace. The rooms overlook family temples and beautiful jungle gardens, they all include a kitchen, large bathtub, shower and large huge bed. Breakfast is included with Bali coffee, pancakes, fruit all served on your private porch. Rp 250,000-400,000, breakfast and tax included, price negotiable if you stay for one week. Taman Indrakila, Jl Raya Sanggingan, ☎ +62 361 975017. Boutique hotel high above the Campuhan River Valley in Sangginan. All rooms have a private terrace. From about Rp 500,000. Ubud Terrace Bungalows, Jl Monkey Forest (about 10 minutes walk south of the Monkey Forest Road-Jl Raya Ubud crossroads), ☎ +62 813 37536464, e-mail: info@ubudterracebungalows.com. Refurbished in 2008. Breakfast included, swimming pool, friendly staff. Tour and shuttle buses booking service. From US$30.00. -8.5094115.258514 Uma Sari Cottages, Jl Bisma (located at the edge of rice fields, a 5 mins walk to Ubud town centre), ☎ +62 361 981538. Balinese style thatch, wood and bamboo cottages surrounded by rice fields. Hibiscus Cottages, Off Jl Bisma (From Cafe Des Artistes, walk slightly further down the road and look for a huge signage on the right - follow the narrow pathway into the edge of rice fields), ☎ +62 361 970475, e-mail: hibiscuscottages@hotmail.com. Family-run, includes breakfast served on your patio. 7 Balinese style concrete cottages surrounded by rice fields. 2 A/C rooms are more expensive but newly built in late 2010. Views from the 2nd storey cottages. Booking by phone is recommended. From Rp 250,000 and up. Villa Indah, Jl Suweta, Br Sakti (2 km north from the tourist information centre), ☎ +62 813 37255277, e-mail: k_suyasa71@yahoo.com. Breakfast included. Friendly Balinese family. 2 rooms and one suite, all have terrace and bathroom with hot water and tub. Stone villa in the middle of the rice fields. Self service kitchen. Motorbike for rent. From US$35. Villa JJ & Spa Ubud, Jl Tirta Tawar, Junjungan, Ubud 80571 Indonesia, ☎ +62 361 4792264, e-mail: info@villajjubud.com. 4-stars villa. Breakfast included. Pet-friendly accommodation. Has sun terrace and 3 outdoor swimming pools. Surrounding by paddy fields. Far from the crowd, Ubud Palace is more than 4 kilometers away and Ubud Monkey Forest is 6 kilometers away. From US$36 for One-Bedroom Joglo Villa, one kid up to 2 years old is free..
Pondok Pundi Village Inn, Jl Monkey Forest, ☎ +62 361 977119, e-mail: info@pondokpundivillagebali.com. 11 guest rooms, each including mini bar, shower, bathrobes, refrigerator located in the central Ubud from US$ 75. Taman Harum Cottages, Jalan Raya Mas, ☎ +62 361975567, e-mail: info@tamanharumcottagesbali.com. Consists of 17 lovely rooms, restaurant, bar, swimming pool with a view of rice paddies, yoga/meditation room. Offers aerobic class, woodcarving studio & workshops. USD 40. Murni's Houses and Tamarind Spa, Jalan Raya (5 minutes walk from the town center), ☎ +62 361 975165, e-mail: murni@murnis.com. Very comfortable, quiet accommodation, excellent spa and meals can be delivered from Murni's Warung restaurant. Breakfast included. Architecturally impressive. All rooms have verandahs and are fly-screened. Pick ups and drops at the airport or anywhere else can be arranged. Tours, classes and activities can also be arranged. Free Wifi. www.murnis.com. From about US$60. -8.5019115.247515 Taman Rahasia (Secret Garden), Penestanan, ☎ +62 361 979395, e-mail: info@balisecretgarden.com. Check-in: 2PM, check-out: 12 noon. 8 room boutique hotel with a lush tropical garden in quiet part of Penestanan. Spa, restaurant and good-sized pool. Free WiFi & free shuttle bus service to Ubud town centre. Does not accept families with children under 7 yr. From US$95. 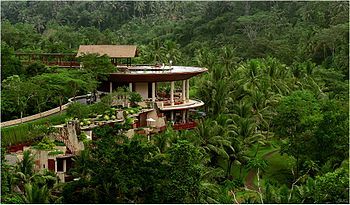 Several of the leading luxury resorts anywhere in Asia are located in Ubud. Expect superb standards, with prices to match. Amandari, Jl Raya Kedewatan, Sayan, ☎ +62 361 975333, e-mail: amandari@amanresorts.com. Check-in: 2PM, check-out: noon. This was the first Aman hotel in Bali built 20 yrs ago. It is getting a little bit tired but is still most impressive. Good views, tennis court, spa, restaurant. A luxury resort with no TVs. From US$750. -8.516907115.28043716 Amori Villa, Banjar Dukuh, Pejeng Kawan, ☎ +62 361 8987799. Check-in: 1PM, check-out: 12 noon. A boutique retreat 3 km from Ubud overlooking Petanu River Valley. Opened in June 2009. Butler service, good food and wine. 5 private suites/villas, all with indoor/outdoor bathrooms, satelliteTV, king beds, free broadband internet access. Shared facilities include a 14 m infinity pool, bale and jacuzzi. From US$215. Barong Resort and Spa, Jl. Monkey Forest, ☎ +62 361 971 759. A/C rooms equipped with cableTV, mini-bar with lunch table, and coffee/tea maker.Outdoor swimming pool, jacuzzi, airport and city transfers, and currency exchange. From US$167.00. Como Shambhala Estate (formerly Begawan Giri Estate), Payangan, ☎ +62 361 978 888. This is one of Bali's most expensive places to stay, and more a collection of super homes than a mere hotel. 20 min north of Ubud, close to the village of Payangan. US$300-4,000. Four Seasons Resort at Sayan, Jl Raya Kedewatan, Sayan, ☎ +62 361 701010. Check-in: 2PM, check-out: noon. One of Bali's truly great hotels, over-looking the Sayan gorge. Suites in the main building, individual villas down by the river. Restaurant and in-house spa facilities. Free shuttle bus to Ubud town centre. From US$460. Komaneka at Bisma, Jl Bisma, ☎ +62 361 971933. Check-in: 1PM, check-out: 11AM. Short distance from the town. Built on a steep hillside with an infinity edge pool and surrounded by terraced rice paddies with a river rushing below. Central hotel block has spacious, tastefully decorated suites, private villas, a wedding chapel and separate spa huts. Komaneka also has two other properties in Ubud, the central and slightly older Monkey Forest and the newer but rather remote Tanggayuda. From US$275. -8.5098115.277617 Maya Ubud, Jl Gunung Sari, Peliatan (about ten minutes east of Ubud town centre), ☎ +62 361 977888. Check-in: 2PM, check-out: 11AM. 10 hectares of land with fine villas, excellent spa and a good restaurant. Architecturally impressive resort with two free form swimming pools. Free shuttle to centre of Ubud. From about US$220. -8.500818115.2765418 Natura Villa Resort and Spa, Br Laplapan (about 15 minutes east from Ubud Centre), ☎ +62 361 978666, fax: +62 361 978222, e-mail: info@naturaresortbali.com. Overlooking Petanu River. Naya Ubud, Jalan Kedewatan 2, Sayan, Br Kutuh (about five minutes west of Ubud town centre), e-mail: reservations@nayaubud.com. Check-in: 2PM, check-out: 12PM. Set within Balinese rice fields, three traditional structures (a Lumbumg, Gladak, and Joglo) house the 5 bedrooms in this boutique luxury resort, surrounded by tropical gardens and an infinity pool. From about US$120. Pertiwi Resort and Spa, Monkey Forest St, ☎ +62 361 975236. Combining traditional Balinese design with modern touches. Alang-alang (thatched) roof, bamboo ceiling, long glass windows. A/C, cableTV, mini-bar, coffee/tea maker. Swimming pools, free wifi access, and a Spa. From US$85. Pita Maha Resort and Spa, Jl Raya Sangginan, ☎ +62 361 974330. Check-in: 2PM, check-out: noon. Hill-side resort with 24 villas. Good restaurant, high quality spa and lovely pool with views. From US$390. The Purist Villas & Spa, Jl. Tirta Tawar, Banjar Kutuh Kaja, ☎ +62 361 974454, e-mail: info@thepuristvillas.com. Check-in: 2PM, check-out: noon. 14-villa boutique resort in the Ubud jungle, close to the Ubud Botanic Garden. US$200-450. Santi Mandala Villa and Spa, Banjar Bucuan, Batuan (about ten minutes drive south of Ubud), ☎ +62 361 297800. Located on the southern outskirts of Ubud. Spa centre, poolside sunken bar and large private villas. From US$150. Ubud Hanging Gardens, Desa Buahan, ☎ +62 361 982700. Check-in: 2PM, check-out: 11AM. On steep terraces overlooking the Ayung river and an ancient temple. 38 luxury villas, each with a heated private swimming pool. Villas with panoramic views of the valley, or riverside villas in the privacy of the gorge. Spa and innovative restaurant. From US$400. The Viceroy Bali, Jl Lanyahan, Banjar Nagi, Laplapan (In the Lembah valley between Ubud and Tampaksiring), ☎ +62 361 971777, e-mail: enquires@theviceroybali.com. Check-in: 1PM, check-out: 11AM. Boutique hotel with four different grades of villa. Pristine valley setting, views from all the villas. In-house spa, good restaurant, shuttle buses into Ubud. A member of Small Leading Hotels of the World. From US$450. Wakanamya Resort and Spa, Penestanan, ☎ +62 361 975719, e-mail: info@wakanamya.com. Check-in: 2PM, check-out: 11AM. Resort in the "painters' village" of Penestanan, built in traditional Balinese style. From US$150. Wapa Di Ume Resort & Spa, Jl. Suweta, Banjar Bentuyung, ☎ +62 361 973178, e-mail: info@wapadiume.com. Check-in: 2PM, check-out: noon. Rural rice field setting 10 min north of Ubud town centre. Well maintained established resort. Good spa services and restaurant, and regular free shuttle buses into Ubud. From US$225. Villa Sabandari, Jl Pura Gunung Sari 4, Peliatan, ☎ +62 361 976586, e-mail: info@sabandari.com. Check-in: 2PM, check-out: noon. A six room boutique hotel in the rice fields. Walking distance from the centre of Ubud. US$200-250. The following are private, individual villas which only take a single group of customers at a time. Agung Khalia Villa, Banjar Sala, Pejeng, ☎ +62 812 3983940, e-mail: info@agungkhalia.com. Private villas from studio to three bedroom and six bedroom. Panoramic rice field and Mount Agung views. Each villa has its own private pool, staff and full service. Only 10 min east from central Ubud in the same valley as the Maya Ubud resort, and close to Goa Gajah. From US$185. De Ubud Villas & Spa, Jl Monkey Forest No.8, ☎ +62 361 981492. Check-in: 2PM, check-out: noon. 3 private pool villas located in central Ubud. Choice of 1 bedroom, 2 bedroom and 3 bedroom villas. From US$260. Kajane Mua Private Villa and Mansion, Jl Monkey Forest, 80571, ☎ +62 361 972877, e-mail: info@kajane.com. Private villas, each with its own private pool. Breakfast and afternoon tea is included in room price and can be brought to the villa each morning or taken at the Kajane Resto. Kajane Resto provides a large selection for each meal and drinks, and room service is available until 11PM at no extra charge. A driver and clean van are provided for free transport around the Ubud area and at low cost to other areas of interest in Bali. For an extra charge, a spa is available on the premises, with panoramic views of private Kajane rice fields. Friendly staff, 15 min walk to Sacred Monkey Forest or Ubud Market and Water Palace. From US$190. Kayumanis Ubud Private Villa & Spa, Sayan Village, ☎ +62 361 972 777, e-mail: experience@kayumanis.com. 23 contemporary villas with private pool, fully-equipped gourmet kitchen and 24-hours butler service. Villa di Abing, Jl Jembawan, ☎ +62 813 38083508. 3 storey, 3 bedroom, fully staffed villa, in central Ubud. Riverside pool, natural green views and within easy walking distance of Ubud town centre. From US$175. Ubud is a safe town to visit and few problems will ever be encountered. police station, Jl Raya Andong (just east of the town centre. Follow Jl Raya Ubud east to the end, turn north and the police station is on your right hand side. ), ☎ +62 361 975316. Be wary around the monkeys that occupy the Monkey Forest. They are experts at stealing possessions like glasses, earrings, cameras and even handbags, and have been known to attack people carrying food. Bali is currently battling a rabies outbreak, and the likelihood is that these monkeys could carry the disease. No matter how cute they look, feeding them is just asking for trouble. Dengue fever outbreaks are not uncommon, so be diligent with mosquito repellant. Ubud does not have a fully fledged hospital and the nearest is about 20 km to the south in Denpasar. There are a number of reasonable clinics, though, which are used to treating typical traveller ailments. -8.5263115.26551 Toya Medika Clinic, Jl Raya Pengosekan (Building is located between Pengosekan gas station and AMRA Museum/Resort), ☎ +62 361 978078, +62 361 7468151, e-mail: toyomedika@yahoo.com. Four doctors and four nurses as well as two drivers and two ambulances (plus administrative staff). Very highly regarded by visitors and locals alike. Open 24/7; emergency and first responder services available as well as the ability to arrange for evacuation, if necessary. Normal services include checkups, medications, vaccination, lab & radiology services, referral to specialists and hospital admissions in Indonesia and overseas. Able to provide visits to caller’s home or hotel. -8.5047115.25552 Ubud Clinic, Jl Raya Campuan 36 (Building is not easily seen from the street, in direction from the centre on the right side behind a corner), ☎ +62 361 974911, e-mail: info@ubudclinic.co.id. Four resident GPs and blood test station to cover basic infections, tests and stiches. Strong focus on international guest, GPs speak English with varying degree. Blood test lab is open from 8AM-3PM (standard blood test takes 4-5 hrs), very basic dentist services. 24/7 GP onsite and basic emergency service. Pharmacy is connected to the clinic. 300'000 Rupees initial consultation, 150'000 Rupees standard blood test. Highway, Jl Raya Ubud, ☎ +62 361 972107. Mostly open 24 hrs daily. Rp 30,000 per hour. Kantor Pos (Post Office), Jl Jembawan. M-Sa 8AM-4PM. 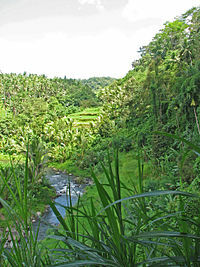 Ubud is well located for moving on to other areas of Bali. The region around Tabanan has Mount Batukaru and the Batukaru Temple, as well as the rice fields around Jati Luwih, about one hour north by car. This city travel guide to Ubud is a star article. It is a high-quality article complete with maps, photos, and great information. If you know of something that has changed, please plunge forward and help it grow!